Do your knees or hips hurt? Most people will at some point have knee or hip pain because these large joints have a demanding task: they must bear the full weight of your body while at the same time allowing for a wide range of motion. Wear and tear, injury, and simple genetic predisposition can all contribute to knee or hip pain. This Special Health Report, Knees and Hips: A troubleshooting guide to knee and hip pain, covers a wide range of knee and hip conditions and describes in detail treatments, preventive strategies, and surgeries. Your knees and hips are your largest joints. They support your body's weight and must work in close coordination to provide the mobility most people take for granted, until injury, arthritis, or other problems interfere. Depending on the cause of your pain, the solution might be a set of exercises, pain relief medication, minor surgery, or some combination of these. But for many people, knee and hip problems become so intractable that the best solution is to replace a worn-out knee or hip with a mechanical joint. This report also includes a Special Bonus Section: Knee and hip replacement which can help you determine if a joint replacement is right for you. It outlines the procedures, describes the different types of implants, and details the various surgical options available to you. Whether you've just started to experience pain or have been battling it for years, this Special Health Report is a must-read. It can help you make informed decisions about maintaining your mobility and independence for years to come. 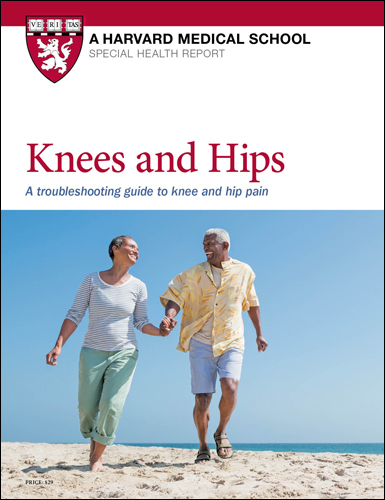 Order your copy of Knees and Hips: A troubleshooting guide to knee and hip pain today. If you are reading this report, you probably have knee or hip pain. You’re not alone. According to the CDC, nearly half of all Americans develop knee arthritis by age 85, and a quarter may develop hip arthritis. Injuries to these joints are also common, even at younger ages. 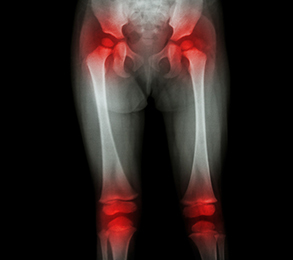 Your knees and hips are your largest joints. While supporting your weight as you stand upright, they must work in close coordination to provide the mobility most of us take for granted. So it’s not surprising, given all that your knees and hips do for you, that they’re prone to injuries and deterioration. As an orthopedic surgeon, I see many patients who have injured a joint because they’ve jumped too quickly into a new sport or workout routine, or have been pushed to exercise too hard. Even if you avoid injuries, you can develop arthritis and other painful conditions from the gradual wear and tear that comes with aging. And increasingly, I see patients whose joints have deteriorated because of the extra weight they carry. Fortunately, joint pain can often be treated with physical therapy, medication, minor surgery, or some combination of these strategies. Ultimately, though, many people find knee and hip problems become so intractable that the best solution is replacing a worn-out knee or hip with a mechanical joint. In the United States, about seven million people are living with an artificial joint, and these surgeries generally help them remain independent and active. Doctors have made dramatic strides in improving the speed and recovery time of these procedures. The surgeries often involve smaller incisions than they used to. Patients get a dose of pain reliever directly to the surgical site, lowering their need for narcotics, and they begin to move around and use the new joint as soon as they wake up from surgery. Hospital stays are much shorter (often just a day or two), and recovery is faster—in fact, day surgery for total joint replacement is on the horizon for some patients. These advances translate into vastly improved lives. I see patients who are able to continue living active lifestyles after joint replacement, to the point that they may even forget they have an artificial joint. Lifestyle changes and proper medical treatment can help you reclaim the life you enjoy, too. Whether you’ve just started to experience pain or have been battling it for years, this report will help you make informed decisions about staying active and independent for years to come.